I spent the better part of this month photographing Berlinale, one of the country’s biggest and most important film festivals. 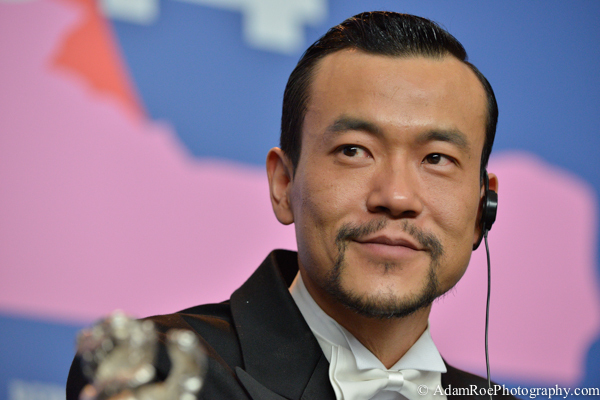 The big winner this year was “Black Coal, Thin Ice”, hailing from China, claiming both best actor and best film. Though plenty of German stars are to be expected on the red carpet, the presence of Hollywood has become somewhat overwhelming. Photos from a festival like this fly around the wire within minutes, but the most interesting photos are rarely even picked up by an agency let alone sold to a magazine. This is a selection of some of my favorite shots of mine from two weeks in Potsdamer Platz. These are about light, about character, about something happening. Edward Norton and BIll Murray were around for opening night, part of The Grand Budapest Hotel and the Monuments Men teams. They enjoyed the red carpet. Mr. Murray posed for us while Mr. Norton mocked us. 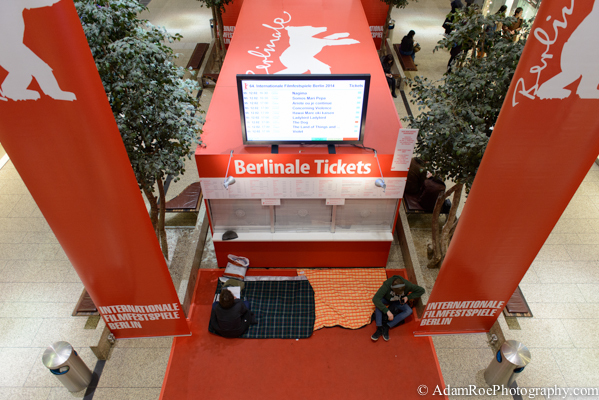 Fans sleeping in the mall in Potsdamer Platz to get tickets for the public, which go on sale early in the morning. Uma Thurman graced the red carpet with presence at the opening of the controversial film Nymphomaniac. This shot caught the flash of another photographer directly behind her head, giving a perfect halo. 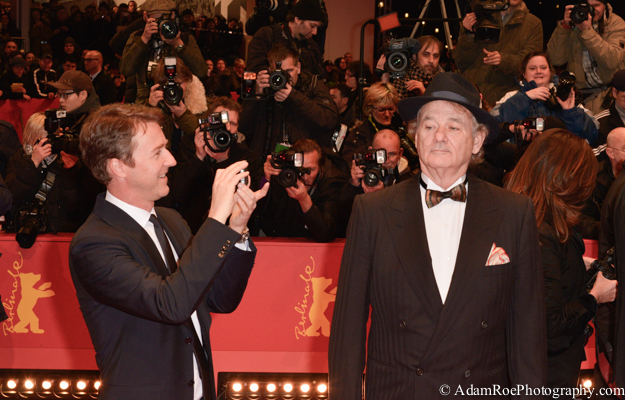 Bill Murray chats with a TV crew on the red carpet at the premiere of Monuments Men. Changing his hat every time and always having fun, Murray was certainly a media favorite this time around. A “Natural Light” shot. 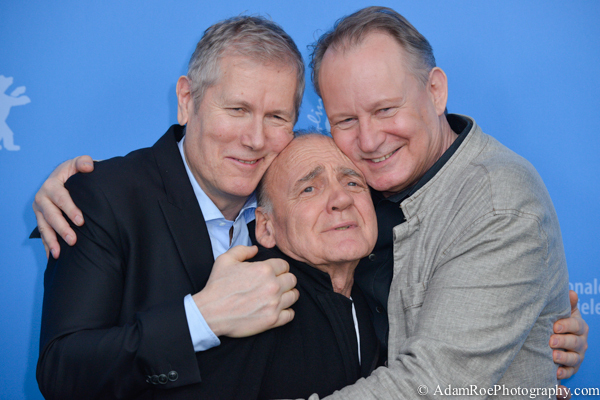 Nothing but love at the photo call for In Order of Disappearance: Hans Petter Moland, Bruno Ganz, and Stellan Skarsgard. Sure. they are actors. But this one shows some emotion, hard to snag at a festival. Diane Kruger poses for a selfie with a fan after the press conference for The Better Angels. Overhead shot with a Fuji X100. I love that she is holding a camera but using her cell phone for the selfie. 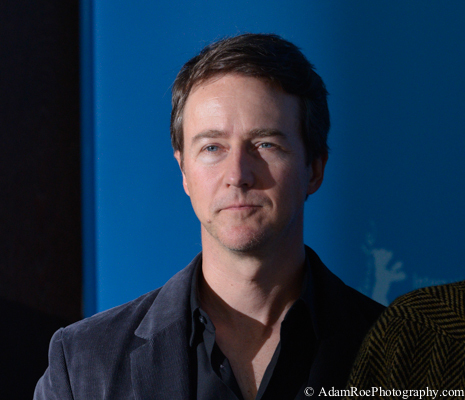 Edward Norton at the Photo Call for Grand Budapest Hotel. My flash did not fire but I caught someone else’s hard light from the side. Intense. 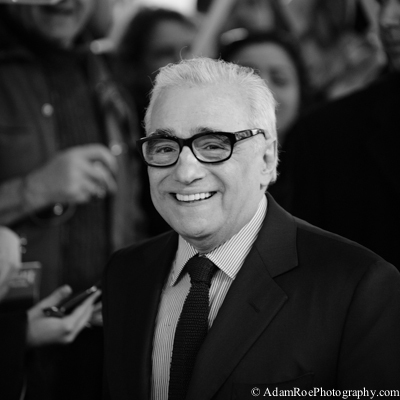 Martin Scorsese showed up to a screening of an unfinished work of his at Berlinale. I wanted to take my Rolleiflex with me that morning but knew I wouldn’t have the time to shoot with an extra camera. But I could crop this shot down to a square, my favorite for portraits. Shia Laboef at the premiere of Nymphomaniac from Lars von Trier. 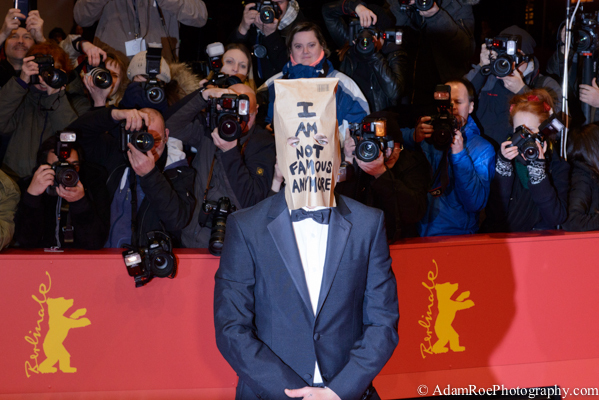 After keeping his head down in the photo call and leaving the press conference after a couple of minutes, he decided to brown bag the red carpet. Potentially the most exciting thing that happened during Berlinale. He strikes me as a bit off. 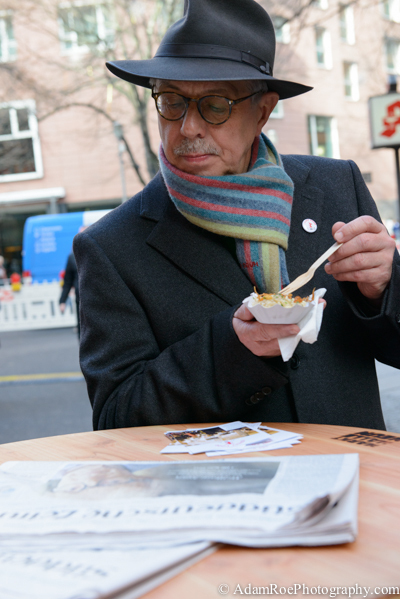 Berlinale’s director Dieter Kosslick takes a pause to read the news at the food carts, a gourmet addition to the scene – but still less pricey than the junk in Potsdamer Platz. Lio Fan wins the best dressed award as well as best actor for his work in Black Coal Thin Ice, which also took home the Golden Bear for best film. Fan cracks a smile during the winner’s press conference. His silver bear pokes into the frame at the left. 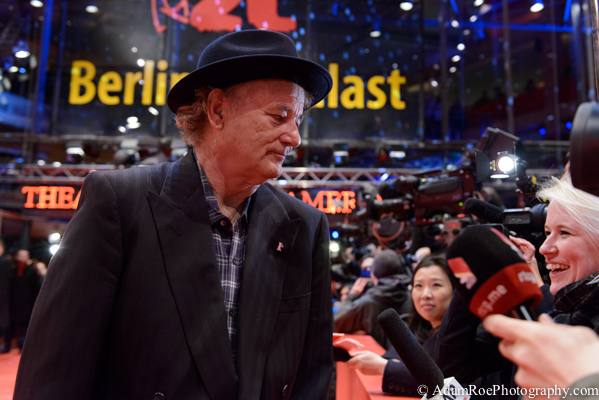 The Monuments Men brought a wave of Hollywood to Berlin. This crew came in singing and conga-lined out of there. Bill Murray, John Goodman, George Clooney, Jean Dujardin, Matt Damon. Most fun photo call ever. The table in the press conference room is wiped down just before the winners come in. That’s it for the kind of interesting shots from the festival which won’t get picked up for publication. A group of young photographers took part in the project Close Up! and got to roam around Berlinale half playing the game of a press photographer and half taking a step back to observe and view the festival in its entirety as a subject. These projects are excellent, artistic, and a lot of fun. If you are in Berlin, swing by C/O’s new digs at the Amerika Haus to see more interesting, refreshing perspectives on Berlinale. This entry was posted in berlin, schauspieler, Strobist, Uncategorized and tagged black and white, festival, film, photographers on tumblr, potsdamer platz, press photography, stars on February 25, 2014 by AdamRoePhotography.